MAVEN » Red Planet: Read, Write, Explore! 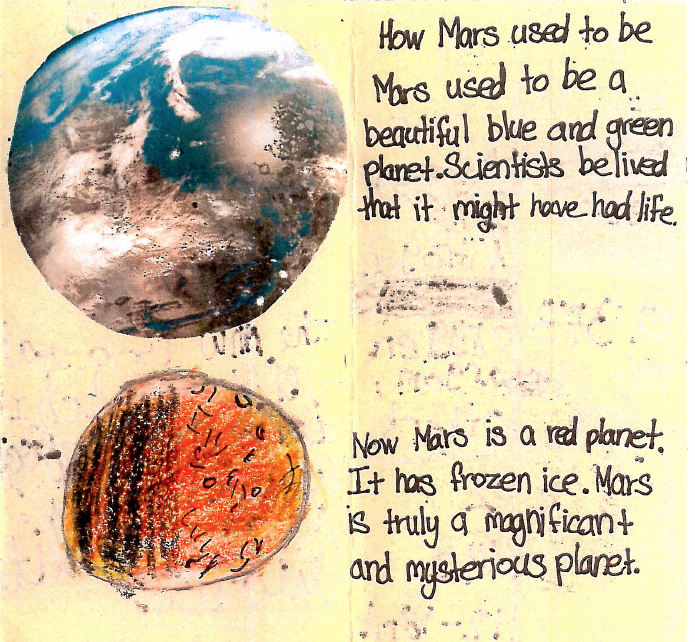 A fifth grader at Acres Green Elementary School in Colorado explains what Mars was like in the past and how it appears today, in the Red Planet activity, Mars in the Future! As a project of the MAVEN Education and Public Outreach program, Red Planet: Read, Write, Explore! proved to be a very effective way to incorporate science into elementary school literacy activities. The project’s flexible, standards-based curriculum used literacy, art, and creative expression as a vehicle for the topic of Mars exploration. The project offered teacher professional development nationally from 2013 to 2016 and, with a special focus on Spanish-language communities, Red Planet: Read, Write, Explore! has been translated for use by Spanish language teachers, English as a Second Language teachers, and others. Please click the links below to access PDF files of the full Red Planet lessons and their corresponding student activity handouts. Red Planet: Welcome to the Program! Lesson 5: Mars in the Future!